Little House Home Arts: Penny Rug Art Goes Political! A couple of years ago one of my daughter’s friends ordered a special pincushion for his relative, an avid Democrat. To be “fair and balanced” I created both a Democrat and Republican pincushion. They are oversized, but I thought, in keeping with the over inflated exuberance of many politicians. I filled them with polyfil, or it would take a weight lifter to pick them up. 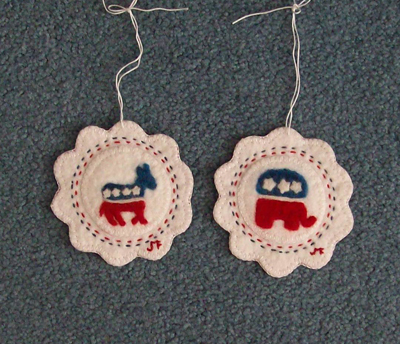 I then created political ornaments, a shrunken minature of the pincushion design to fit tastefully (?) on a Christmas tree. Folkart reflects American life and what is more American than political campaigns, conventions and elections! In truth these were not my first political creations. As a young woman, I did a special quilted GOP patchwork elephant for my father, whose initials were GLC, to celebrate the country's Bicentennial year. He was an active Republican who served as a campaign manager for a state representative. My father’s volunteer position was secure for many years and he loved caucus meetings and serving as a delegate to the state convention! I just wanted to share that Americana Folkart knows no limits. In keeping with a promise I made to my daughter, Hannah, I am sparing my blog from my political views, though I truly love and respect our freedom to make choices about who is going to lead us. Like all other areas of life, politics is not too sacred to enjoy its’ humor and if you enjoy dry New England humor, don’t miss Jon Katz’s writing, New Member: Bedlam Farm Men’s Support Group in his Farm Journal on August 24, 2012. (http://www.bedlamfarm.com/page/7/) He reports on the emergency meeting held where members of this group discussed the issue of the recent concern regarding who should make decisions for women. Strut, the rooster and Simon, the donkey along with the other members of Jon’s support group had much to say! Don’t miss the wonderful fun Jon has in reporting their views! Jon has become one of my favorite authors, and his blog is refreshing and fun, and a great escape from tedious and mundane life in the fast lane! Thanks so much Cindy! The convention always reminds me of my Dad and how much he loved politics!